The HPR1000 is a pressurised water reactor (PWR) that has been developed by CGN, a company with over 30 years’ experience of designing, constructing and operating nuclear power stations in China. The HPR1000 is a robust design with three separate safety systems. 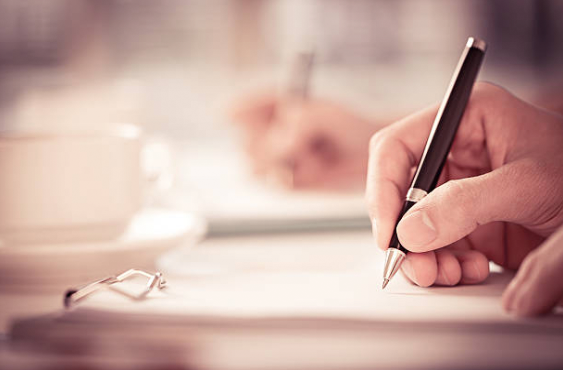 It incorporates active and passive safety systems, enhanced emergency power ability, and comprehensive severe accident prevention and mitigation measures. In the event of an accident or malfunction, these systems and features will ensure that the reactor is brought to a safe state. The nuclear and nuclear safety-related facilities are located within this area. 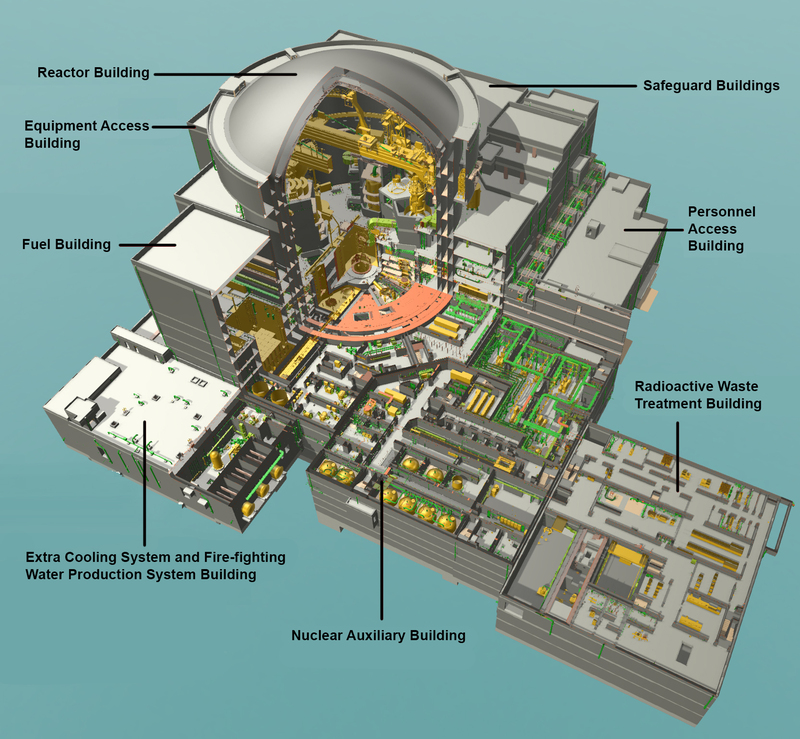 These include the reactor building, safeguard buildings, fuel building and nuclear auxiliary building and are shown on the diagram. The external containment is made from reinforced concrete. It is designed to protect the building from external hazards, which includes the impact of a large-scale aircraft and external explosive blasts, tornados and fires. The internal containment is a pre-stressed reinforced concrete structure with a stainless-steel lining. 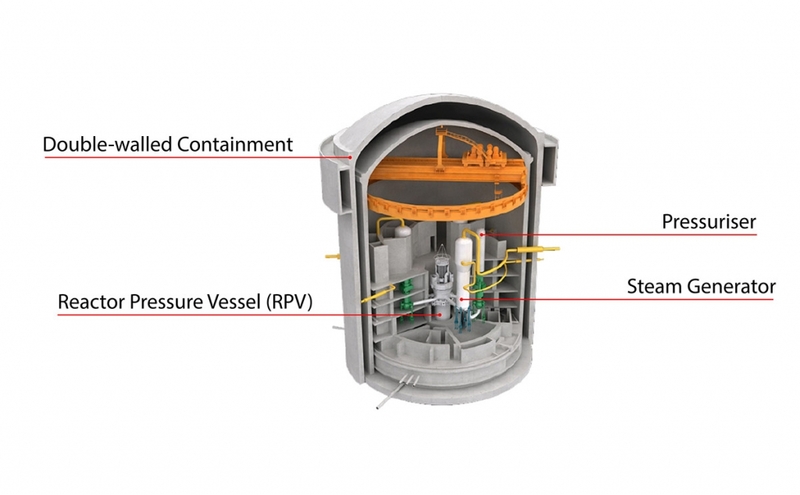 The internal containment protects against nuclear radiation, supports the reactor cooling system and supports safety funtions for the containment and safety systems. Between the two walls there is a continuous corridor. A ventilation and filtration system keeps the pressure in the corridor below the atmospheric pressure. This is a safety feature to ensure that, in the case of an accident, radioactive substances are not released into the environment. Inside the reactor building, the reactor core, reactor pressure vessel, steam generator, pressuriser, coolant pumps and some main steam pipelines and water supply pipelines are housed. 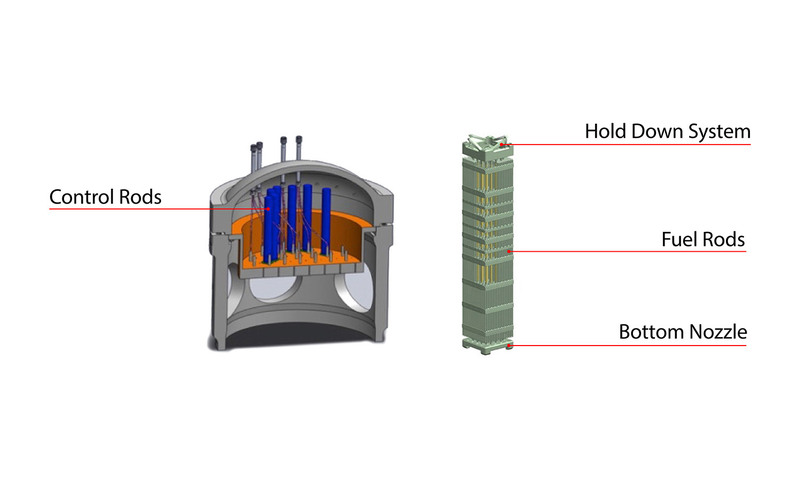 The HPR1000 reactor consists of the fuel assemblies and related components, these components mainly contain Reactor Pressure Vessel (RPV), Reactor Vessel Internals (RVI), Control Rod Drive Mechanism (CRDM), Reactor Head Package (RHP), supporting structure and insulations. 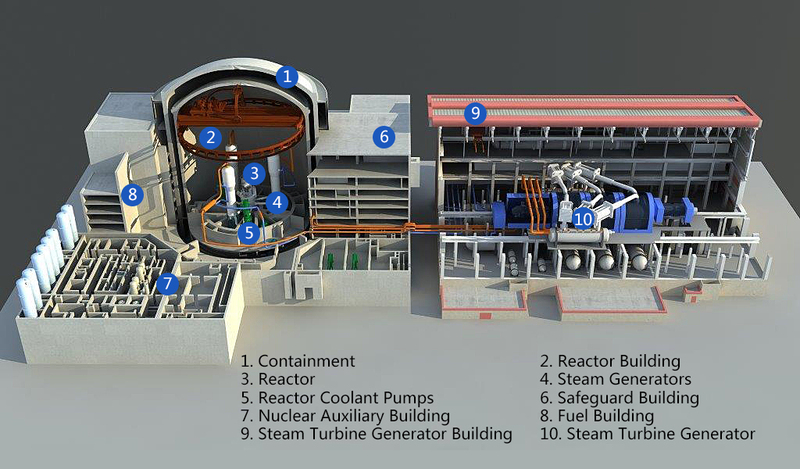 The reactor core contains the nuclear fuel components and is where the nuclear reactions take place and the heat is generated. The reactor core of the HPR1000 is made up of 177 sets of 12ft (3.6m) fuel assemblies. Each fuel assembly consists of 264 fuel rods, 24 guide tubes and 1-gauge pipe which are arranged in a 17 x 17 array. The guide tubes provide insertion channels for the control rods, neutron source rods (to start the nuclear reaction) and choke plug rods (insert function). The upper part of the guide tube has a larger internal diameter to allow quick insertion of a control rod in case of an emergency shutdown. The HPR1000 is equipped with 68 sets of control rod assemblies. Each control rod assembly is made up of a set of neutron absorbers with their upper ends fixed on a star frame. The control rod assemblies can control the reactivity of the reactor quickly. Control rod groups consist of power compensation rods and temperature regulation rods. Shutdown rod groups provide negative reactivity to slow down and stop the nuclear reactions in the event of a reactor shutdown. 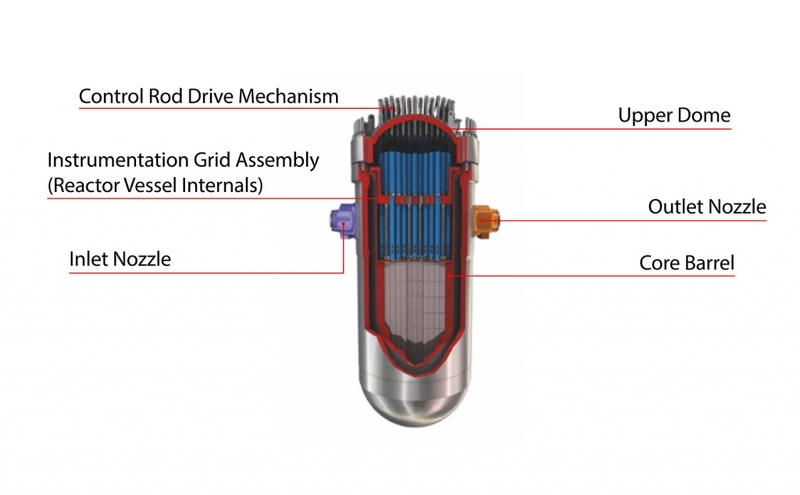 The RPV is the heart of the nuclear reactor, where the nuclear fission reaction takes place and is the highest reliability pressure boundary to contain the reactor core, core support internals and light water coolant. It provides support and position for RVI CRDM and in-core instrumentation. The RPV consists of vessel body and closure head. Vessel body is a cylindrical welded forged assembly, which consists of the flange-nozzle shell, core shell and lower head, welded together by circumferential welds. The closure head is a removable flanged forged hemispherical upper head, to allow for refuelling of reactor core during planned outages. The primary circuit of the HPR1000 is composed of three loops. One inlet (or cold leg) nozzle and one outlet (or hot leg) nozzle of RPV are covered in each reactor coolant loop. The reactor coolant enters the reactor vessel from inlet nozzle, and pass through the down-comer annulus between RPV and RVI, then turns and go through the core region, exits the reactor through the RPV outlet nozzle, flow along the reactor coolant pipe and enter into the steam generator. The safeguard buildings house the main control room, the main fluid machinery systems and other supporting systems which will deliver safety functions. 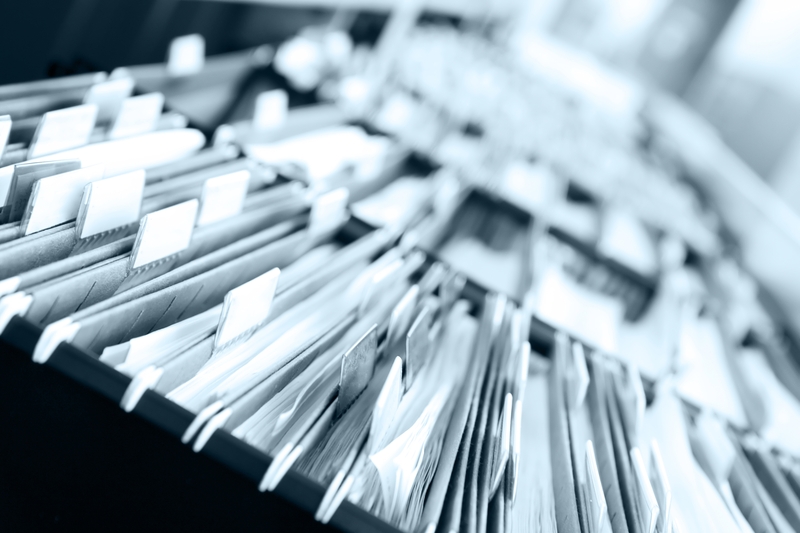 The buildings are designed to be ‘Category 1’ earthquake-proof to protect the integrity and stability of the buildings and to maintain the shielding and containment functions in the case of an accident. The safety buildings are divided into three totally separated zones located around the reactor building. If anything malfunctions within one zone, the other two will continue to operate and will not be affected. The fuel building is used for the location and operation of the Fuel Handling and Storage system. It also contains the reactor refuelling water tank and spent fuel water tank cooling and processing system, chemical and volume control system and the reactor boron and water supply system. The systems located in the auxiliary buildings include boron recycling, waste gas processing, nuclear island exhaust and drainage system. This is where the turbine and electrical power generator and related facilities are sited. The equipment and systems used to convert the heat energy from the steam into kinetic energy and electric power are located in the turbine building. They include the steam turbine, power generator and condenser and a heater to increase thermal efficiency. These include the Essential Service Water Pump Stations, the Firefighting System Building, and other equipment. Many of the buildings and structures, other than the reactor building, are similar to those that would be found on any coal or gas power generation site.